"Those who are merciful will be shown mercy by the Most Merciful. Be merciful to those on the earth and the One in the heavens will have mercy upon you." “Whoever relieves a believer’s distress of the distressful aspects of this world, Allah will rescue him from a difficulty of the difficulties of the Hereafter. Whoever alleviates [the situation of] one in dire straits who cannot repay his debt, Allah will alleviate his lot in both this world and in the Hereafter. Whoever conceals [the faults of] a Muslim, Allah will conceal [his faults] in this life and the Hereafter. Allah is helping the servant as long as the servant is helping his brother. Whoever follows a path in order to seek knowledge thereby, Allah will make easy doe him, due to it, a path to Paradise. No people gather together in a house of the houses of Allah, reciting the Book of Allah and studying it among themselves, except that tranquility descended upon them, mercy covers them, the angels surround them and Allah makes mention of them to those in His presence. "The truthful and trustworthy business owner will be in the company of Prophets, saints and martyrs on the Day of Judgment." "The truest poetic verse ever said by a poet, is: Indeed! Everything except Allah, is perishable." “The parent is the best of the gates of Paradise. 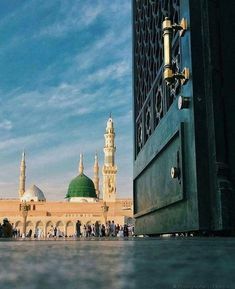 Anas(ra) has related that "Once our Prophet - may he be eternally blessed - went to a young man who was on his death bed and asked him 'How do you feel?' The young man said, 'I have much hope from Allah but I also fear for my sins'. The Holy Prophet(pbuh) said, The believer who has these two ideas simultaneously at such time, Allah fulfils his hopes and grants him security from fear." "Charity does not decrease wealth. And no one humbles himself for Allah except that Allah raises his status." "The best form of worship is to wait (patiently) for a happy outcome."